The Liongate is a traditional English town house dating back to 1721, now a completely refurbished 4 star boutique hotel, with 50 individually designed en suite rooms. Upstairs the Park Suite, which enjoys spectacular views over Bushy Park and Hampton Court Palace, is an ideal venue for private functions, parties, weddings or meetings. Downstairs The Black Olive, an informal restaurant serving Mediterranean and modern English cuisine, has been created offering a selection of dishes throughout the day. The Black Olive restaurant is comfortable, relaxing and yet the service is attentive. Cast your eyes around and the attention that has been paid to detail is most obvious. Our Head Chefs are proud of the progress the restaurant has made since its launch. 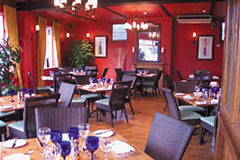 "We've had wonderful compliments about the food - which is all any good restaurant can ask for". The restaurant itself is contemporary and yet rustic, reminiscent of the Southern Mediterranean. It could almost be in Toulouse or Beziers. The Black Olive also boasts a separate bar and lounge area, with a soft setting, offering informal but contemporary and stylish surroundings. Open every day from 7.30am-9.30pm. All major credit cards accepted. No service charge. The Black Olive is a fine dining restaurant to visit - to take time to sample and savour the culinary creations of our Head Chefs and their teams.